This comment and reaction on Hospice care by Angil appeared under the article, Now I'll Tell You About Franny, and Hospice Care Increasing for Nursing Home Patients with Dementia . As a previous Hospice Nurse, I can tell you there is more to it than a 6 month prognosis. Medicare has a set of hospice appropriate guidelines in which patients qualify for services. If a family feels hospice may be appropriate, yet the physician won't provide a terminal diagnosis (which many are hesitant to do), families can call hospice to come to the home to discuss their loved one's condition, and hospice can initiate the order for services. They can either call the primary physician and let the physician know why this person is hospice appropriate and request the order, or they all have a physician as the Medical Director who can order services, but the patient will probably need to transfer from their primary physician to the ordering physician. Eliminating Medicare payment for hospice services will be a human tragedy! Most medical professionals have a mindset and focus of curative treatment and care. Few have the expertise in palliative (comfort) care and assisting a patient and family through the dying process. Working in traditional curative healthcare and hospice, I can tell you these are 2 very different mindsets and perspectives in healthcare. I have never met a person who has experience with utilizing hospice in their family that wasn't extremely grateful for what hospice did for their loved one and family. Generally people who have experience with hospice can't say enough good things about hospice. You don't find that in curative healthcare. The reason patients with dementia may live longer in nursing homes with hospice services is because they are finally being treated appropriately and are comfortable. Things like pain, and anxiety take a toll on the human body. When hospice orders pain and anxiety medications those symptoms decrease or disappear leaving patients comfortable and rested, reducing the effects on the body. Curative physicians and nurses have a fear of over medicating for pain control, often leaving patients suffering. There is no fear of that in hospice. As pain control and palliative care experts, they recognize that it often takes a much higher doseage of pain medications to relieve pain. There is no fear of addiction, which is often the case with curative professionals. Just as it is necessary to have OB/Gyn's to bring life into the world, it is as necessary to have Hospice professionals helping people die a peaceful and comfortable death. Hospice professionals are experts in dying, bringing comfort to their patients AND their families. By the way, family's include anyone close to the patient. 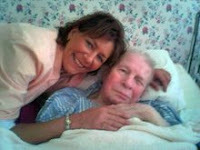 Friends, neighbors, paid Homecare aides, whoever spends time with the patient and will be there in the dying process. Curative professionals rarely give much inclusion to family's when it comes to treating patients. I don't know about you, but when an illness, injury, or impeding death affects a patient, I believe it has affects on the whole family. We aren't bubbled in our own world if we are sick, hurt, or dying. Families need care too. We need strong advocacy to protect the right to paid hospice services. Angil Tarach-Ritchey(RN GCM) has over 30 years of experience, and is a nationally known expert in senior care and advocacy. Angil is also the owner of Visiting Angels in Ann Arbor, Michigan.